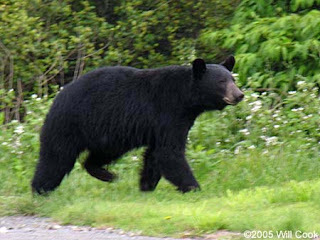 I had a sense that we were in for a treat on this road trip when that black bear went dashing across the highway, about one hundred feet in front of us, just a few kilometres outside Fort McMurray on our way south to Edmonton. The black mass was ambling in the west side ditch, something clutched in its mouth-dinner for a little later-when it made its decisions to head east. A bear is a rare sight these days, so we were immediately stoked. The 10 deer that followed only served to heightened our appetite for wildlife. All of a sudden something was dancing off in the distance, a mama moose and its recent offspring, chasing each other in play enjoying the mid-morning sunshine-quite a sight. Several hawks, a lone coyote and even a squirmy little gopher came into our sights. When the sun is shining and the landscape is green, watching for animals is a perfect compliment to the journey. It's interesting how the presence of animals can have a completely different effect at other times of the year. In the dullness of dusk, they can inject a solid measure of apprehension and fear without even being present. Thankfully, dusk happens crazy late at night in this part of the work in summer, long after the car has been parked and we put the car keys to bed.